DQ Series high repetition rate Pockels cell driver has been designed for use in mode-locked lasers for cavity dumping or for cavity Q-switching of solid-state nanosecond lasers. 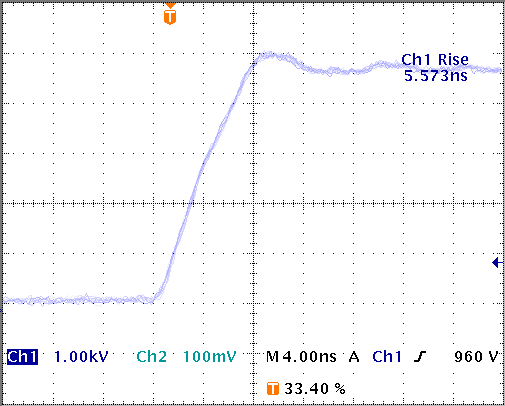 3) Heatsink temperature should be bellow 35° C at 100 kHz pulse repetition rate. 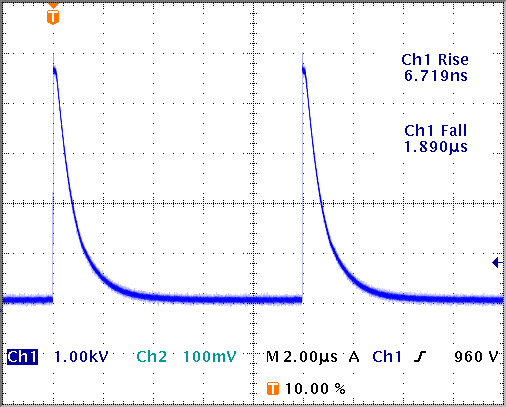 Fast HV rise time <7 ns for 4 kV pulse. DQ Series high repetition rate Pockels cell driver has been designed for use in mode-locked lasers for cavity dumping or for cavity Q-switching of solid-state nanosecond lasers. Fast HV (less than 7 ns) edge ensures excellent pre- and post-pulse contrast. Ability to operate at high pulse repetition rates makes this driver perfect fit for most of diode-pumped nanosecond lasers. For pulse repetition rates up to 10 kHz heatsink is not required. For high repetition rates the driver should be attached to the heatsink with thermal resistance of at least 0.4 °C/W for room temperature (25 °C) operation. Pockels cell driver should be mounted into dielectric box (should be ordered separately) providing electrical insulation. Low voltage power supply is required to internal triggering circuit, while tuning of HV power supply voltage.